The Seahawks could begin the 2019 season with just two or three players remaining from the team that beat Denver in the Super Bowl five years ago Saturday. Has it really been five years since that glorious night when professional football’s grandest stage morphed into CenturyLink Field East? Given all that has happened since — that fateful pass at the 1-yard line, the dismantling of the Legion of Boom, Marshawn Lynch retiring and unretiring — it feels like lifetime ago. Whichever camp you fall in, Saturday (Feb. 2) marks the first real milestone anniversary of the greatest moment in Seahawks history, if not all of Seattle sports — five years since the 43-8 win over the Denver Broncos in Super Bowl XLVIII on that warmer-than-expected night at MetLife Stadium in New Jersey, the team’s first, and so far only, Super Bowl title. When the 2019 season begins, it’s possible that just three players will remain from that team — quarterback Russell Wilson, linebacker Bobby Wagner and receiver Doug Baldwin (and Baldwin’s status as a Seahawk in 2019 doesn’t appear ironclad). At the most, there could be five if linebacker K.J. Wright and offensive lineman J.R Sweezy re-sign, assuming Earl Thomas and Kam Chancellor, who still is on the roster, will no longer be around. The coaching staff has also undergone massive change. Just 10 of 24 from that season remain, with both coordinators gone (and we’re counting Ken Norton Jr., who departed for two seasons before returning last year, among those who remain). What will never disappear are the memories of a night when, for a rare time in Seattle’s largely tortured sports history, everything turned out perfectly. A USA Today rating of all 52 Super Bowls this week slotted Seattle’s win dead last due mostly to how quickly the Seahawks turned what was viewed as an appetizing matchup of the highest-scoring offense in NFL history against one of the league’s all-time best defenses into a rout. “The chasm between pregame expectations and final outcome might have been the widest in history,’’ wrote USA Today’s Nate Davis. No one in Seattle cared about the lack of drama even if for the neutral observer the game was undoubtedly a dud. It may be easy to forget now that the Seahawks were actually two-point underdogs, one of only two times in 2013 Seattle wasn’t favored (the Seahawks were also three-point underdogs for a December regular-season game at San Francisco that the 49ers won 19-17). It took just 12 seconds for Seattle to wipe that out, as Seahawks fans influenced a bad snap that sailed into the end zone on Denver’s first play which resulted in a safety and the fastest points scored in Super Bowl history. That, and all that happened next, are happily preserved for history in the NFL Films’ official Super Bowl game film as well as the “America’s Game” documentary of Seattle’s 2013 season, which each feature scenes that when viewed now take on a little different tenor than they did then thanks to the passage of time. (To name one, “America’s Game” features a scene of Wilson and Sherman walking off the field together following the NFC title game win over the 49ers, singing along to “New York, New York” as it played over the stadium speakers. Wilson tells Sherman “good game’’ and Sherman leans over and kisses Wilson on the head while Wilson then responds “love you, man. Love you.’’ If only the love had survived). The NFL Films Super Bowl coverage captures the momentary angst of the game’s announcers, including Steve Raible, when the Seahawks were forced to settle for two field goals instead of touchdowns in the first quarter en route to an 8-0 lead. There was no way that was going to work against a Peyton Manning-led offense that scored 606 points that season, which remains the most in NFL history. But in a rare time when a Carroll team did indeed win a game in the first and second quarters, the Seahawks blew it open with two scores to take a 22-0 halftime lead, including Malcolm Smith’s 69-yard interception return that would help earn him game MVP honors. Then came the Percy Harvin kickoff return for a touchdown to open the second half that sealed it. The rest was a coronation. “We’re about to be legendary,’’ Sherman said to teammates late in the game (it’s largely forgotten that he suffered a high ankle sprain in the final minutes and left the field on crutches). In “America’s Game,’’ Carroll is captured at one point saying “so good, so good’’ on the field after one late play. Then it switches to an interview of Carroll explaining that moment. Indeed, if much of rest of the country tuned out about the time Harvin broke past midfield, Seahawks fans joyously soaked in every last second. Speaking of soaking, the hardest task for the Seahawks in the second half came when Wilson and tight end Zach Miller had to wade through teammates and others on the sideline to carry the Gatorade bucket to where Carroll was standing to give him the obligatory celebratory bath. In a moment that now tugs at the heartstrings even more, Carroll is shown in the happy postgame on-field celebration spotting Paul Allen and throwing a towel at him to get his attention. 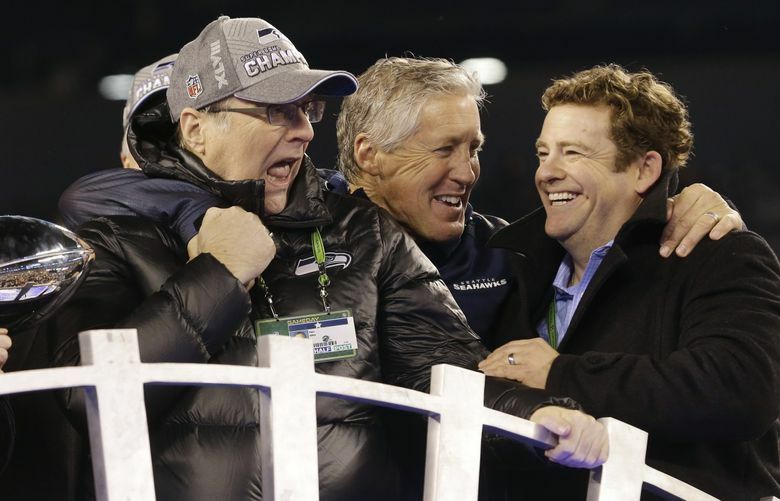 “Hey!’’ Carroll yells as Allen recognizes him — barely four years and a month after Allen hired Carroll to revive the franchise in the wake of two seasons in which the Seahawks had gone a combined 9-23 — before the two share a hug. In the locker room later, just before it was opened to the media, Carroll shared one final word with his team. If for some reason they don’t, Seattle always will.